Here’s Flurry, in her temporary pen. We got a new goat over the weekend. Her name is Flurry. I’m not sure what kind of goat she is. She’s about a year old now, and still pretty tiny! She was the smaller of a set of twins, and was babied by her owners, so she’s super sweet. A friend of mine gave her to us ’cause her other goats weren’t letting Flurry get any food, and were bullying her. As we were picking her up, my friend pointed out that there was a bald spot on the goat’s side, and said that it was just “rain rot” and to rub any old fungicide (even for athlete’s foot) on it, and that it should go away pretty quickly. I didn’t really look her over, just assumed she was fine and took her home. Well, once we got her back to our place I noticed that she had some major dandruff. Not thinking much of it, I put her in the pen with Mocha and went inside to look up “rain rot”. While I was searching I came across some articles about goat’s having dandruff. Turns out that noticeably flaky skin is a major sign of lice! Lice?! Oh my goodness. Please don’t have lice. It was getting dark outside. Should I separate the goats? What if Flurry does have lice? I don’t want my beautiful Mocha to get it! What if she has something else that Mocha could catch? I debated on what to do. I didn’t have anywhere to put Flurry. I really didn’t want to infect Mocha though. I went outside in the freezing night with a little flashlight to check on the goats. They were both in their house. I figured it was probably too late to do anything anyways, they’d already been together, so I left them there. The next morning I went outside to check her out better. Wearing a pair of rubber gloves, I pulled back some fur from her back and took a closer look. Sure enough, there were little tan bugs crawling all over her! Ewwwww!! Oh my goodness! She’s crawling with bugs! Yes. I freaked out. Not sure, but I’m assuming they are lice. Now my head is itching. Great! What do I do? I cleaned out the dog lot where we were keeping the pig, and put Flurry in there to keep her separated until we fix the problem. The pig is now back in with Mocha. I’ve been asking around for advice on how to treat lice. I found a billion different suggestions, but nothing that says “this will definitely work”. On one forum somebody said that they’ve successfully treated their goats with Sevin Dust for years, soooo… that’s what I’m trying first. I’ve sprinkled her back and her bedding. *Hopefully* that will do it. Now I guess I have to wait to see if Mocha gets it. I’ve cleaned out her bedding as well. Just gonna keep an eye on her. Maybe I’ll get lucky and she won’t get infested too. Oh, and because I know you are wondering, No, people cannot get lice from goats. That’s what everything says anyways, so I just keep telling myself that every time my scalp crawls! I have to be honest. At first, I was totally disgusted and wanted to take her back right then. I do not want a goat with something that can spread to the other animals! 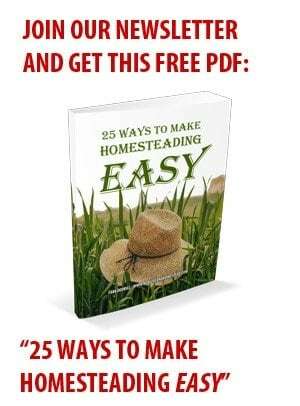 But then I was reminded… this is homesteading. Animals get yucky stuff. You can’t keep them perfect forever. And you shouldn’t get rid of one just because it isn’t perfect. This is treatable, it will just take a little bit of work. So, we’re gonna bite the bullet and get whatever is necessary to take care of the bugs and get this little goat healthy again. In the meantime, we’ll keep her separated from the other animals until she’s all cleared up. 1. Always check over a goat to make sure that it is in good health before bringing them home, no matter where you are getting it from! 2. Always keep a new goat separated from the rest of the herd for the first two weeks of having her home… just in case she does have something they could catch! I’m smacking myself right now. Dang, I wish I’d followed this common sense advice!! Great post! We have found that seven dust works too. We normally combine it with DE and sprinkle the goats and their living area. 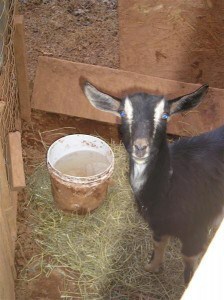 We love our goats and they are part of our family because they are part of our homestead. Kendra, it is your responsibility to keep your animals healthy and that sevins dust is, unless suggested by a vet, is not a good idea. You should be calling a vet to get some suggestions – what your goat has my cross to your pig, your other goat, and your chickens and dog. Self sufficiency is one thing but I believe in this situation consulting a professional would be important to ensure that you know what you are actually dealing with and the course of medication give and how to deal with all of your pets. Can you kill them the same way as on people? When my girls got it from church then we soaked their hair in olive oil & combed their hair ALOT! I had a calf that was crawling with lice. I bought some dust at the local feed store. I think, not sure it had permectin in it. I actually called the company and they said it was pretty safe. The dust worked really well. I put some rubber gloves on and sprinkled it on. I tried to rub it down into the hair then threw the gloves out and took a shower! Keep with it! Try looking into food grade diatomaceous earth. I know it works for fleas and such and is super good for animals, to get rid of internal parasites, etc. It is completely safe for people, too, which is good with kids running around. Kendra, sorry you had to learn that one the hard way, but I’m glad you shared such a valuable lesson! We will be buying goats this spring, and although I don’t have any other animals (just dogs), I probably wouldn’t have thoroughly checked them over. Of course, my husband is much wiser in the ways of farming/ranching, so I’m sure he’d have looked over any animal before we got it home. I’m so blessed to have him! He keeps me from making many mistakes! Wow. Good advice. Just sorry you had to learn it that way. i’m definitely taking note for myself in the future! A friend of mine says that in Romania, they always use Lavender oil to repel lice. I have no clue if it will get rid of them, but it’s a pleasant smell! You might want to put some on yourself when you are tending to Flurry for a while – until you’re sure they’re all dead. Kim- Thanks for the tip! I wouldn’t have even thought of that with chickens. Guess it’s a good idea no matter what kind of animal it is, huh? !